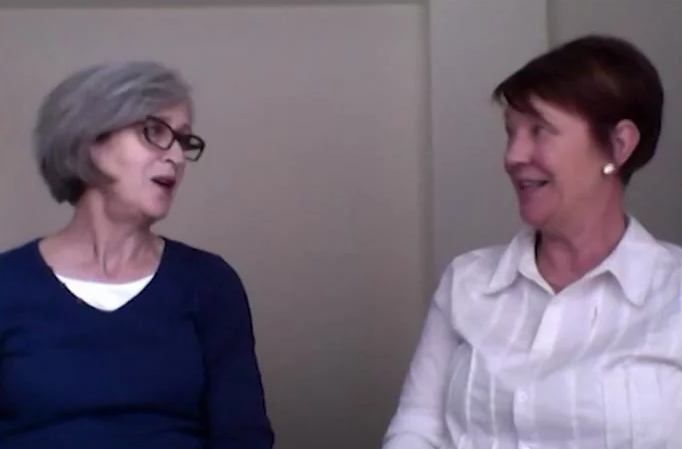 Gaye Stockell and Marilyn O’Neill have been engaging with narrative ideas for well over twenty years. They were two of the first practitioners to use ‘re-authoring practices’ within psychiatric settings. In this video presentation they look back to the ‘Worthy of Discussion Groups’ that took place in a community mental health rehabilitation service. They describe how these groups involved reconstructing identities and inviting preferred stories of self. Marilyn and Gaye also discuss how they are now engaged with people in reconstructing identities in many other contexts, including within prisons. We invite your reflections on this video and the social construction of identity. O’Neill, M. (2004). ‘Researching “suicidal thoughts” and archiving young people’s insider knowledges.’ International Journal of Narrative Therapy and Community Work, 3:38-40. and Angela, Brett & Jess (2004). ‘A conversation with Angela, Brett and Jess about suicidal thoughts, failure and resistance.’ International Journal of Narrative Therapy and Community Work, 3:41-42. Burr, V. (1995). An introduction to social construction. New York: Routledge. Hamkins, S. (2005) ‘Introducing narrative psychiatry: Narrative approaches to initial psychiatric consultations’ International Journal of Narrative Therapy and Community Work, 1:5-17. White, M. (1995). ‘Psychotic experience and discourse (Stewart, K. interviewer).’ in Re-Authoring Lives: Interviews & essays (chapter 5), pp.112-154. Adelaide: Dulwich Centre Publications. White, M. (1997). Narratives of Therapists’ Lives. (Chapters I, IV, IX, X). Adelaide: Dulwich Centre Publications. Worrall, A. (2008). When your child is diagnosed with schizophrenia: The skills and knowledges of parents International Journal of Narrative Therapy and Community Work, (4), 27-37. I really appreciated your questions and they cover many that we have asked and continue to ask ourselves over the years. Some of the things that you touch on such as having someone as a collaborator and using narrative style / de-construction conversations as a way of opening space to other possible notions have at times saved me from rage or frustrations suggestions. Their ideas about how i should respond almost always in my experience close down the conversational space but they do become appealing in the face of unhelpful even if ‘well intended’ practice let alone blatant injustice. Keep on keeping on its great for all in the community to have resisters in the ranks. Thank you for giving us a view of your listening with music and passion. It is a wonderful history that Narrative has over more than 20 years so glad you have discovered it it is worth exploring the journey of the development of the ideas. Maybe that would be another great friday discussion! I am curious about what your question suggests about your struggles to not make judgement or give advise and to stay available to listening to the stories of the men you work with. It is in these stories even those that do not fit with your knowledge of living lives that you will get openings to the discovery of what these men their lives and what that preference is connected to in terms of their values dreams and commitments. These are the story lines that in my experience reconnect people to options for living and thinking. I am also mindful of the irony that exists in traditional care settings between ideas of ‘normality’ and what is considered good for people and what actually works to assist folk to reclaim a life that represents what really matters for themselves. I think your questions are very related to what we talk about in the video but externalising the diagnosis might not be externalising the problem as Raymond taught us with his metaphor where it was the effects of Diagnosis i.e.. The Black Dot Experience that was the problem. Thank – you for such a tender telling on preferred stories and identities. What made me smile at the beginning was Marlyin’s smile when she remembered becoming acquainted with Narrative Ideas – it’s as if a light goes on. I was stuck by how Marlyin and Gaye have held onto ideas of social construction, power relations, and categorizing people in difficult contexts for over 20 years. I would be interested in how Marlyin and Gaye have been able to hold onto to these ideas of – Enabling convesations in disabling contexts? How have they supported each other ? Borrowing from Raymond – How have you weeded out unhelpful ideas and nurtured helpful ideas? I’m always interested in what types of support workers put in place to help them hold onto what is important to them. Marlyin’s point about asking de – construction questions in relation to projects was very helpful to me. What are the implications for the people that we are servicing? I have worked in disabling contexts and it’s hard not to become the rebel – when systems are forcing you to label, write reports, document everything, and take a position of power. When I worked in a youth prison in the States, I would write up notes with the boys and smuggle in cup cakes and music that was deeply important to them. The cold conditions of the prison had boys eating their own hands, dealing with abuse from staff made it difficult for them to sometimes feel human. It was so difficult to have enabling conversations with staff members in the prison because they were under the influence of punishment, power, and black dot ideas. In disabling contexts I have found the people I am working with to be the rewarding and honoring part of my work – and the politics of the work place to be often crushing. I loved the ideas of the woman in prison about identifying what people and practices have stolen her identity. This could be so helpful to the many women I have worked with. It left me thinking what people, animals, and beliefs help one hold onto their sense of self. I would be interested in the relationship of fear and stolen identities. I was in awe how this women despite living in hard conditions was appreciating herself in a better way and feeling stronger. I am inspired to have more enabling conversations and not let people’s identities and my own be reduced to a black dot and to fill in the white canvas with hopes, colors, dreams and steps we have and are taking. First, thank you for sharing your thoughts and ideas. Now, let me set the scence: I watched the video trying to focus on what was being said, although my mind was already wandering to my questions and thoughts. Then, I put some tango music on, because I found out that this is what narrative practice is for me: passion and improvisation! And now for my thoughts. The first thing that caught my attention was the fact that narrative practice is more than 20 years old! I’ve known it for a bit more thatn 1 year and I had forgotten that it existed before that! The second thing that caught my attention was the white canvas and the black dot. I found myself trapped in the same idea, noticing the dot only and forgetting about the rest. I would like to use it also in my practice, if I may. Now, my questions and thoughts. I am involved in a long term residency, in which 10 men, all schizophrenic have spent more than 10 years of their lives. All of them identify themselves as schizophrenic and believe that it is through their medication only that life goes on, but also attribute to this medication all kinds of problems (lack of motivation, being obese, being bored). I have started working with them as a group (a Losers group? ), and every Friday that I visit that residency I find myself wondering how to proceed. On the one hand, I would love to ask them about their lives, consider them as experts and discuss with them about their dreams and hopes for their future. On the other hand, as many times as I tried to do so, I found myself listening to stories from their careless childhood that has passed many years ago. And then I hear them saying things about their everyday life that I find so wrong and I am so tempted to correct them and tell them what is “true” (for instance, that you can actually quit alcohol although you’ve been drinking for more than 20 years). In conclusion, in this setting I have to struggle with my own ideas about these people’s lives and then I will manage (will I?) to struggle with their ideas about their lives. Any ideas on identity reconstruction as welcome at this point. My second thought is kind of the opposite than the previous one. The last week, in the clinic where I work, there was a man with the diagnosis of “paranoid schizophrenia”. I tried to externalise his ideas that he has been the victim of political conspiracies, but this was not possible for me. So, eventually, I tried to call his problem “a disease” or “schizophrenia” hoping that I would at least help him collaborate with taking his medication as a way to cope with these ideas. I consider this thought “opposite” to the previous one, because here I tried to “identify” this person as schizophrenic” hoping that this would help him. As I read back these thoughts, I am not sure how they relate to the video of today. But somehow they do! So, I am looking forward to some feedback.